Dopamine (4-(2-aminoethyl)benzene-1,2-diol), a biogenic amine, is a member of the catecholamine family. 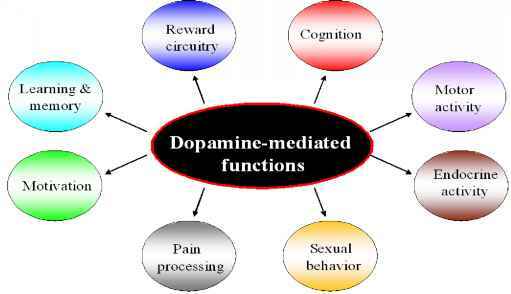 In the central nervous system (CNS), dopamine plays a crucial role as a neurotransmitter and regulates a variety of vital brain functions, such as cognition, motor coordination, endocrine activity, reward circuitry, pain processing, mood, motivation, and learning and memory (Figure 1). Dopaminergic (DA-ergic) neurons of substantia nigra pars compacta (SNpc) are involved in the control of voluntary movements and postural reflexes. From SNpc, DA-ergic neurons project to the striatum (caudate and putamen), therefore, death of these neurons in SNpc causes dopamine deficiency in the striatum, leading to Parkinson disease (PD). This disease can be clinically characterized by movement disorders, including muscle rigidity, tremor at rest, slowness of physical movement (bradykinesia) and impaired balance and coordination (postural instability) in PD patients. DA-ergic neurons in the ventral tegmental area are also involved in modulation of rewarding and cognitive behaviors, and their dysfunction may lead to the pathogenesis of addiction and mood disorders. Brain aging is associated with a decline in dopamine-mediated functions, implicating loss of DA-ergic neurons. A marked decline in dopamine system with aging includes a gradual loss of presynaptic markers such as dopamine transporters , and post-synaptic markers such as dopamine receptors [2-3]. Such decline in markers has been consistently observed in striatal, neocortical, and limbic areas . Alterations between midbrain dopamine synthesis and prefrontal activity in cortical reward processing with human aging suggest that dopamine system involved with reward processing becomes vulnerable with aging . The magnification of catechol-o-methyltransferase (COMT) gene with aging provides novel information on the inverted U-shaped relation linking DA-ergic neuromodulation in prefrontal cortex to cognitive performance . Molecular imaging studies have demonstrated impairment in multiple cognitive tasks with age, implicating loss of dopamine in aged brain [4,7-8]. Thus, aging can be considered as one of the most important risk factor for PD. The etiology of PD involves both familial (genetic) and environmental (sporadic) factors. Predisposing factors in sporadic PD include trauma, diet and environmental factors, including exposures to metals (manganese, iron), drinking well water, herbicides and pesticides [9-10]. Association of several genes along with other risk factors, such as gender, race, and positive family history, support the occurrence of familial PD. 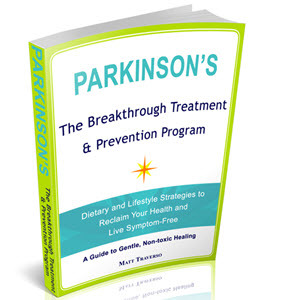 PD is one of the most common neurodegenerative movement disorder. A prominent feature of this disease is the loss of striatal dopamine. Current treatment strategies for PD mainly involve pharmacotherapy using DA-ergic drugs like 3,4-dihydroxy-L-phenylalanine (L-DOPA, a precursor required for dopamine synthesis), and deprenyl (Selgiline), an inhibitor of monomanine oxidase B (MAOB; the enzyme that breaks down dopamine), as well as neuroablation or neurostimulation of the downstream brainstem nuclei affected by the DA-ergic deficit . These strategies are associated with limited effectiveness and side effects but do not cure the disease. They do not address the underlying problem of the progressive loss of DA-ergic neurons. Therefore, more compelling strategies are required to expand treatment beyond the classical dopamine replacement towards the targeted reconstruction of nigrostrial pathway. This chapter summarizes dopamine metabolism, receptor classification, behavior, signaling, and possible molecular mechanisms involved with the nigrostriatal DA-ergic neurodegeneration, which may help in understanding the pathogenesis of PD.